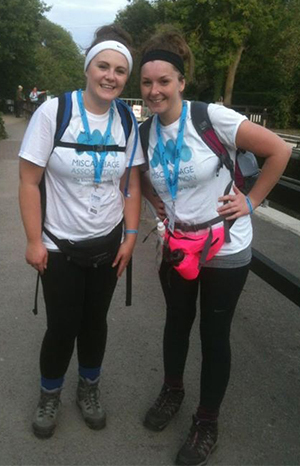 When Amie and I signed up for the Thames Path Challenge it was our mission to raise money and more importantly awareness of the charity, Miscarriage Association. So many people go through the pain of miscarriage with out really fully knowing what support is available to them and end up suffering in silence. Even if we made one person aware that there was a charity that could provide them with information and support, that was one more than there was before. Whenever we trained for our 50km walk we promoted our fundraising page on our social media sites with pictures, shared one another’s statuses and wore our t-shirts whilst out walking. In total we raised over £2,400.00 and walked from Runnymede to Henley on Thames in just over 11 and a half hours – we couldn’t of been happier in what we achieved on 13th September 2014.